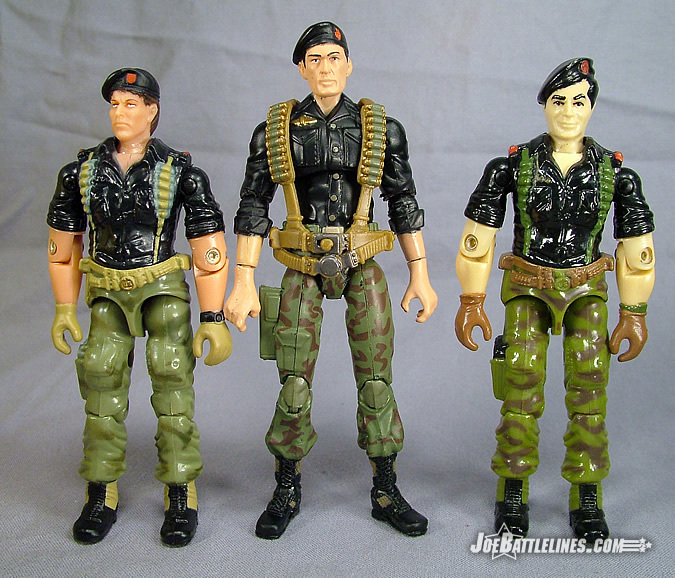 I can still remember the first time I watched the second animated GIJoe mini-series “The Revenge of Cobra” on WGN. Bigger in scale than the previous animated epic, this five-part story introduced three characters that immediately made an impression upon my young mind: Lady Jaye, Shipwreck, and Flint. The defacto “second in command” in that particular storyline, the character of Flint proved himself to be a valuable asset to the team and remained a strong presence in the animated series from that point forward. 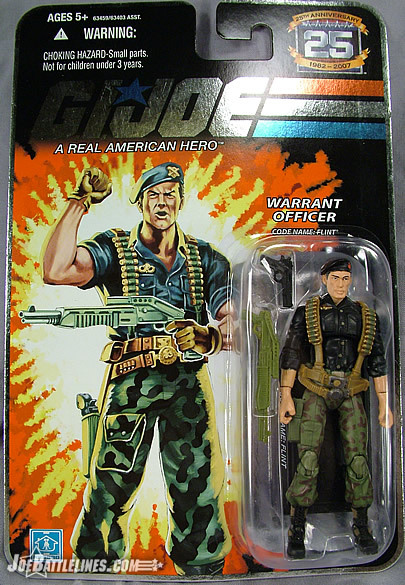 Oddly enough, Flint was a character whose action figures never managed to quite capture his “signature look”; the ARAH version always looked a bit too “James Garner” while the GvC version was a bit too anime for most fans. 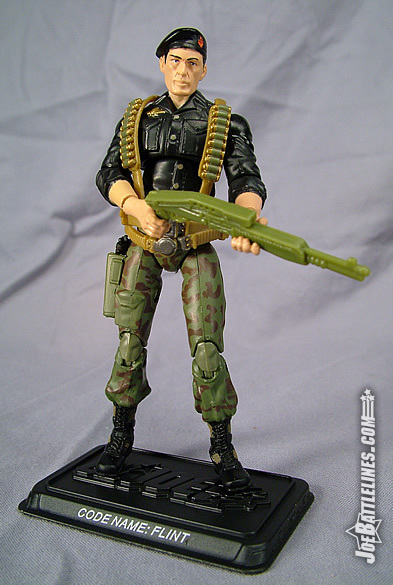 Hasbro once again tries to replicate the definitive uniform for Flint in the 25th Anniversary line with a fair amount of success. In stretching the budget of the 25th Anniversary line to the absolute maximum, Hasbro has designed figure bodies to be somewhat generic in nature. By simply adding character-specific web gear and new head sculpts, the toymakers in Pawtucket seem to be striving for the most “Joe for the buck” and for the most part that strategy is working from a design standpoint. Flint is a perfect example of this practice; his body is entirely that of the Battle Pack Duke released just a few scant weeks earlier. 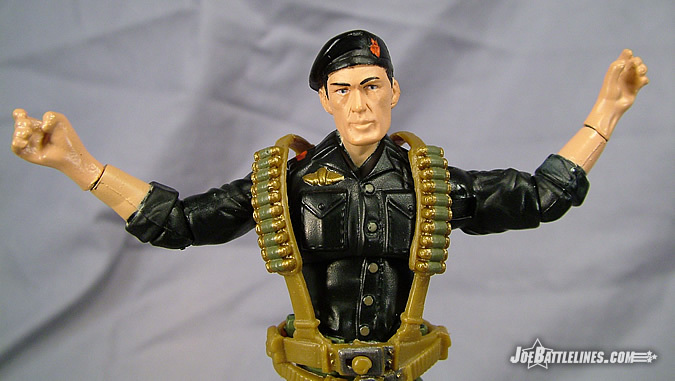 The same arms, legs, torso, and holster from the team’s “First Sergeant” are also used to make up its premiere Warrant Officer. Duke and Flint share enough common design elements—a uniform composed of a long sleeve shirt and BDU pants with combat boots—that this parts reuse makes perfect sense. In fact, I’m going to go out on a limb and state that the parts actually look better on Flint than on Duke! 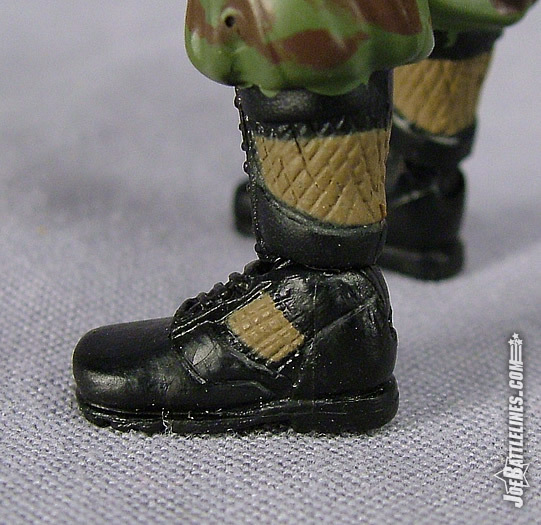 Whereas the Battle Pack figures were painted in lighter “animation tones”, this figure utilizes a much darker color palette. Flint’s shirt is black, his pants a dark olive with brown camouflage, and his boots are black with tan highlights. Even his skin tone is darker-- implying that Officer Fairborne just might spend more time in the sun than Duke. The color matching between mold halves is much better on Flint than on Duke whose pants vary in tone from side to side. 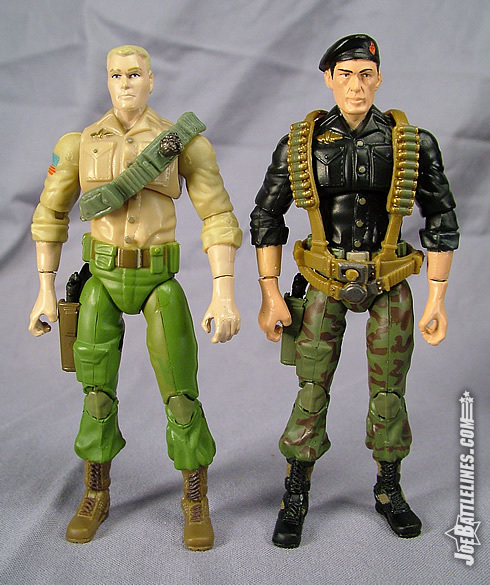 The only real oddity is that Flint’s side holster is painted olive to match his pants—which seems a bit odd as it should stand out from the material as opposed to blending in. Gold paint is used to highlight the molded buttons on his shirt as well as the airborne badge found by his right collar. The only element missing from this character design are the gloves that Flint worn in his debut figure. 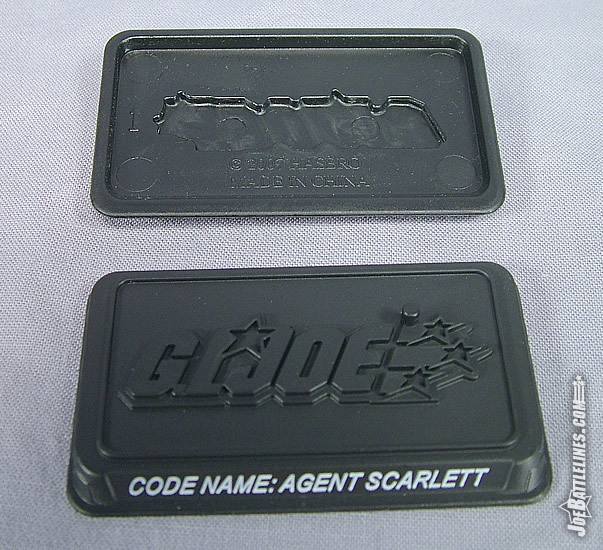 Hasbro has stated that these were dropped due to rushed production issues, which also seem to plague the debut Battle Packs. However, the overall look is intact and one that is decidedly Officer Fairborne. For once, a total parts reuse works and works well to recreate another distinct character so I’ve no complaints here. In order to turn Duke into Flint, two parts were replaced— Flint’s head and web gear are unique to him. The head sculpt actually baffled me at first as early pictures of the figure conveyed the impression of an over-sized head. However, first-hand examination actually reveals a head that is surprisingly proportionate and less like a Spy Troops rubber mask. 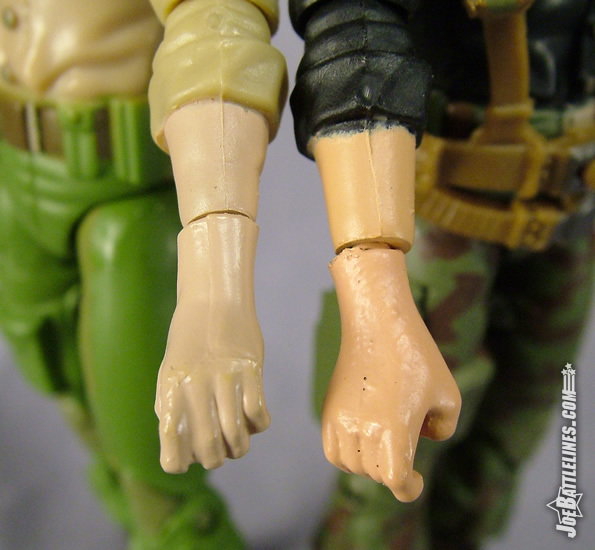 (If anything, Flint leads me to believe that Duke’s head is actually a bit small!) 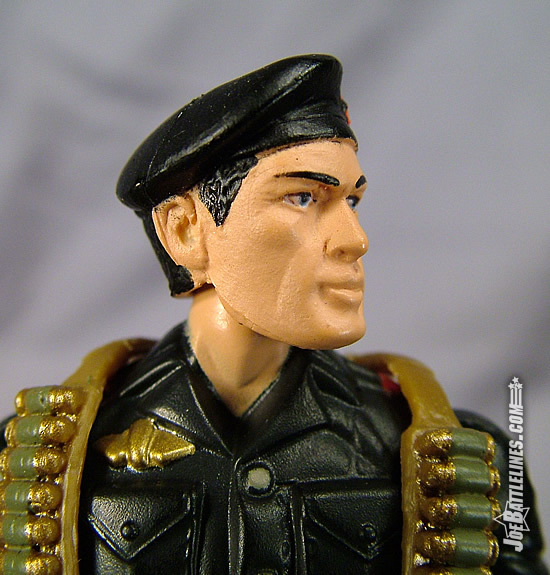 The head sculpt is far closer to the classic image of Flint than anything previously released with a sculpted beret. 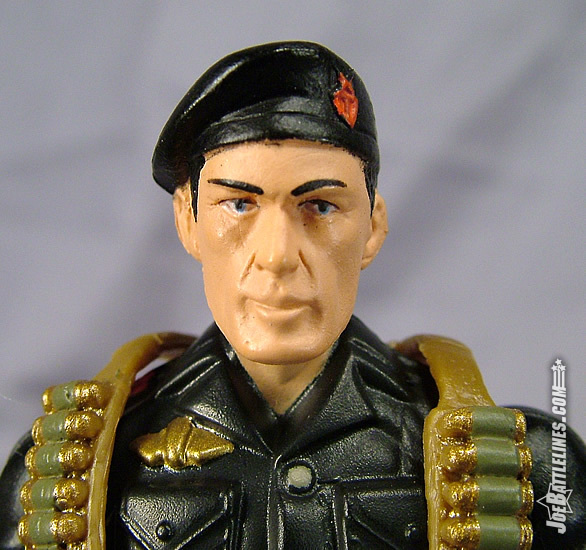 The jaw line is strong, the set of the eyes are properly spaced, and the cant of the beret is just where I’d picture it to be. Honestly, the only thing that seems even remotely off is the slightly gaunt nature of the cheeks. I’m willing to bet that this a result of the painted skin tone more than it is the actual sculpt itself and is something that would have been corrected had Hasbro chosen to mold this head in flesh toned plastic. Whereas Duke had a decidedly “animated” countenance, Flint is much closer to the card art of the original figure—which is something that I prefer. As this line progresses, I’d prefer to see the “overly cartoony” dropped in favor of designs that are much closer to the “real world”. The second new part included with this character is a brand new set of web gear that replaces Duke’s bandoleer. The new harness features sculpted shotgun shells and a dual-belt system with a gold buckle. 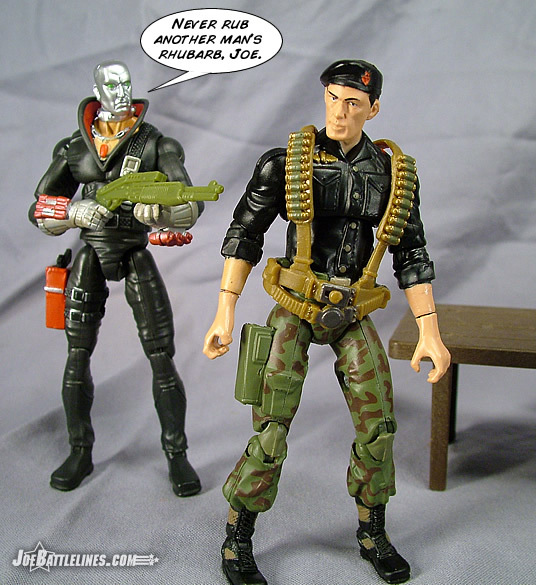 It would seem that this is the trend for this line as figures like Snake Eyes, Duke, Cobra Trooper, Cobra Officer, and now Flint have all employed the use of new web gear to transform one mold into either a new character or another version of the same. While Flint’s harness doesn’t fit perfectly, it’s a pretty slick piece of design work, especially at this early point in the line. 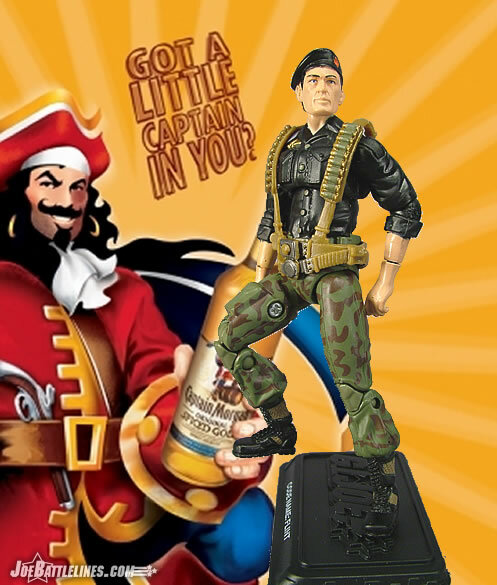 Flint, like the rest of the figures in this line, comes with a faction-specific display base and character-specific weapon. 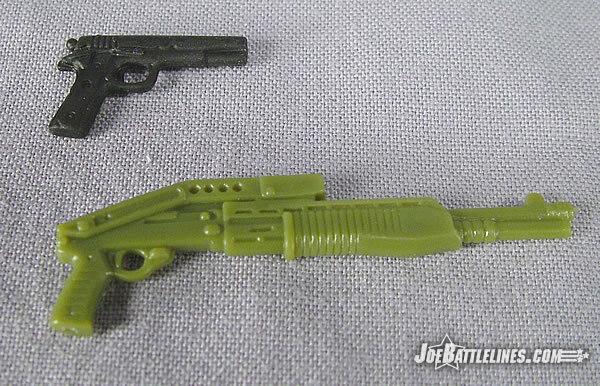 The included shotgun is a reuse of one that we’ve seen throughout the GvC era. 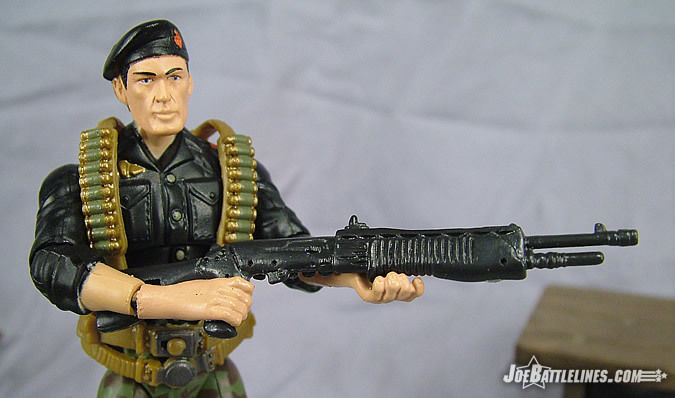 Personally I’ve opted to replace it with the Marauder Tactical Shotgun. His file card is found on the back of the cardboard backing. 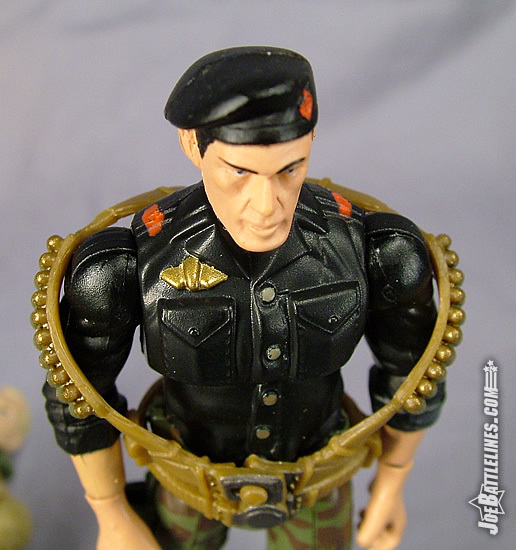 As this figure reuses Duke’s body, the same articulation issues apply to Flint that applied to Duke. 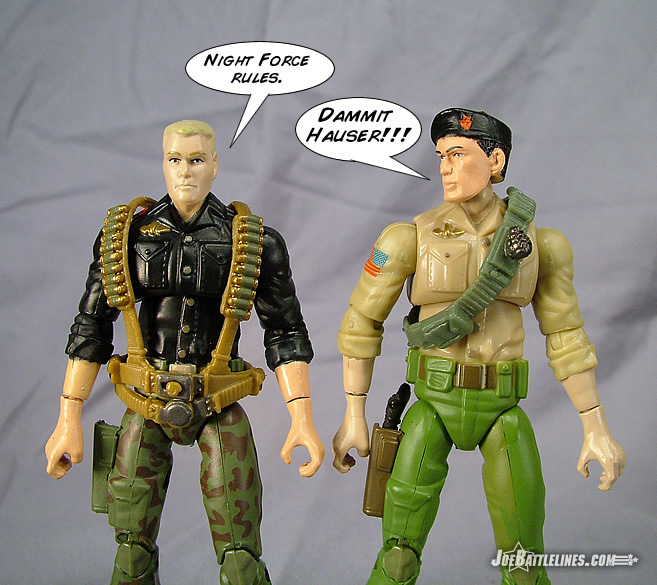 I won’t rehash them here but it is still safe to say that Hasbro has a ways to go before this becomes the “definitive” GIJoe line in my eyes. My Flint underwent some quality time “under the Dremel” and the comparison picture in this review reflects that. After adjusting his waist and elbows, I’ve finally achieved the same range of motion found in the ARAH sculpt of the figure. The sad thing is that I shouldn’t have to do this sort of adjust in the first place. Of the two figures that share this body, Flint is my favorite of the two. A darker color scheme and more realistic head sculpt produce a much more dynamic figure that is amazingly close to the original card art. (The new card art is uncannily similar to the original—with the biggest change being the new shotgun.) Had this figure not required additional adjustments to free up his articulation I’d declare him the best Flint figure released. However, I’m still not entirely sold on the new scale and on the new body type. From a character design standpoint, this figure is really pretty amazing and shows that Hasbro can successfully update a figure that is over 20 years old. So, while he’s not perfect, Flint is one of the best figures in this line so far and one that I can recommend to collectors seeking to delve into the 25A line.